Despite the seemingly obvious link between good management and firm performance, establishing a causal link between the two is actually rather tricky. This column examines how Portuguese firms responded to the sudden and unexpected end to the civil war in Angola in 2002, and discovers an immediate spike in export entry rates for firms with at least one manager with previous experience of exporting to Angola. This finding on the impact of acquired knowledge on performance is especially useful for firms looking to operate in foreign markets. In the spirit of Syverson’s quote, recent empirical studies have exploited the increasing availability of information on managerial practices and managers’ characteristics to establish a strong connection with firm (as well as country) productivity and other dimensions of performance. More specifically, Bloom and Van Reenen (2010), Bloom et al. (2013), Bloom et al. (2016b), and Guiso and Rustichini (2011), among others, have established that better managers and managerial practices lead to better firm performance. Even though this might seem obvious to many, including to practitioners and businessmen, establishing a causal link between managers and firm performance is actually rather tricky due to the presence of many correlated unobservable factors and strong selection effects at work. At the same time, what is really interesting about this literature is the magnitude of the implied effects. Having good managers and managerial practices is like having a superior production technology and is at least as important as key firm investments like innovation, capital, and human resources. We believe the next question to be addressed in this literature is what happens when managers move from one firm to another. Does a firm hiring a good manager improve its performance? By how much? If yes, is it due to the manager’s intrinsic capabilities or is it due to the knowledge and abilities the manager has learned in previous firms? What happens to the firm when the ‘good’ manager leaves? There are two challenges we face. The first is separating a manager’s intrinsic capabilities from the knowledge and abilities she has learned in previous firms. The second is showing that such acquired knowledge and abilities impact current firm performance. We deal with these by exploiting unusually rich data for a small open economy — international trade data at the firm-country-product level and matched employer-employee panel data covering Portuguese firms from 1997 to 2005 — and a powerful combination of econometric designs. In order to separate a manager’s intrinsic capabilities from the knowledge and abilities she has learned in previous firms, we use information on whether the manager has worked in the past for firms exporting to a specific destination country or a specific product. Our data are then rich enough to allow controlling for both manager and firm unobservables and wash out any time-invariant abilities of the manager, as well as overall firm performance. In order to show that such acquired knowledge and abilities impact current firm performance, we relate the destination-specific or product-specific measure of acquired knowledge (e.g. experience in exporting shoes) to the current firm trade performance in these same specific destinations or products (e.g. the probability of exporting shoes). We deal with the endogeneity of hiring in two complementary ways. 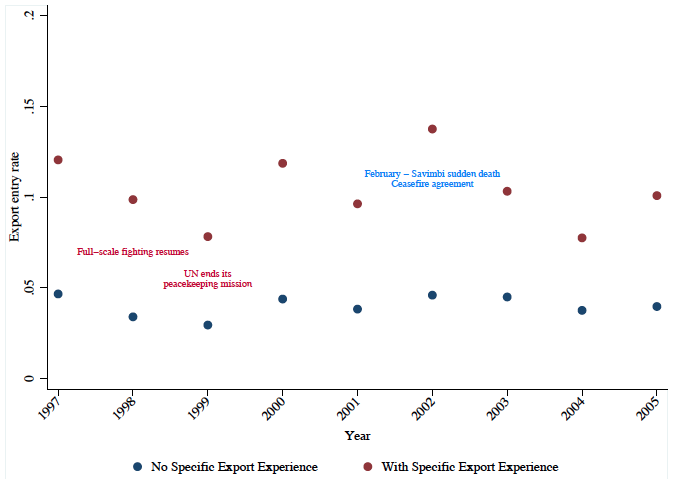 First, we focus on a subset of the data and explore the differential performance of firms with and without managers with export experience specific to Angola in the wake of an exogenous event, namely, the sudden end of the Angolan civil war in 2002. Second, we draw on the panel nature of the entire dataset and use information on whether the firm had managers with destination-specific or product-specific export experience three years prior to evaluating firm performance in those destinations or products. Moving to export experience and firms’ trade performance, Figures 1 and 2 show the probability of starting exporting to a given destination or a given product, in 2005, for three categories of firms: those without managers with export experience, those with at least one manager with export experience, and those with at least one manager with specific (to the destination or product) export experience. In all instances, the presence of managers with export experience is associated with a higher probability of starting exporting, while at the same time having at least one manager with specific export experience is associated with an even higher probability.3 In our paper, we report results from an extensive set of regressions — in some cases controlling for firm-year fixed effects — that confirm the patterns shown in the figures. The presence of a manager with specific export experience increases the probability of starting to export by 2-4% which roughly corresponds to half of the unconditional probability of starting exporting to a specific destination or a specific product. We refer the reader to the paper for additional results regarding the probability of continuing exporting, the intensive margin of exports, as well as a discussion of various econometric issues. We focus here, instead, on one of the multiple ways we deal with the causal interpretation of our findings: the differential performance of firms with and without managers, with destination-specific export experience in the wake of the sudden end of the Angolan civil war. Angola is a former Portuguese colony that still has strong commercial ties with Portugal and belongs to the Community of Portuguese Language Countries (CPLC). The war started many years prior to our observational period (1997-2005) and ended, suddenly, with the death of the rebels’ leader, Jonas Savimbi, on 22 February 2002. As discussed in Guidolin and La Ferrara (2007), the event was completely unexpected and represents an exogenous conflict-related event. This means that, right after the shock, firms did not have the time to prepare themselves to take advantage of the opportunities offered by the new politically stable setting, for example by hiring managers with export experience in Angola. Yet, some firms in 2002 already had managers with export experience in Angola, while others did not. 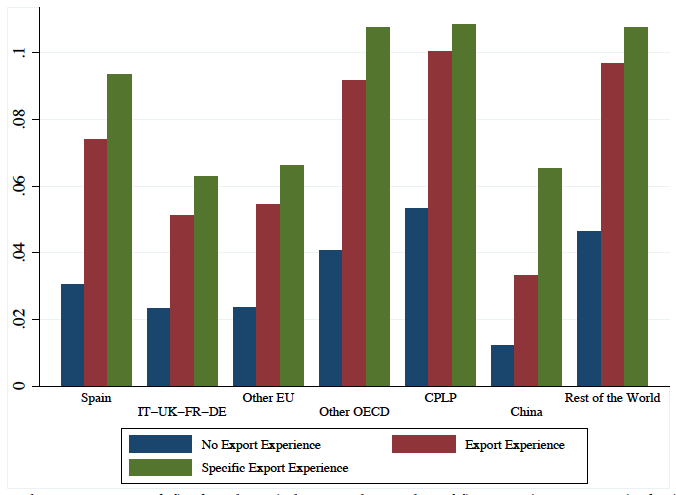 Figure 3 shows export entry rates for firms with at least one manager with specific export experience in Angola and firms without such managers. In line with our previous results, entry rates for the former group are always larger than for the latter group. Crucially, there is a sudden spike in export entry rates for firms with at least one manager with export experience in Angola in 2002. The situation is then a bit mixed after 2002, which can be understood with other shocks taking place as well as firms having had the time to adjust to the new situation. Regression results reported in our paper confirm that, even controlling for firm-time covariates and year dummies, the presence of a manager with experience in exporting to Angola increases the likelihood to start exporting there by 2% (with respect to firms without such a manager). In the rest of our paper we present additional results regarding the arrival and departure — as opposed to presence and absence — of managers with export experience, consistent with the view that managers bring in new export knowledge and, in some cases, this knowledge remains in the firm even after managers leave. 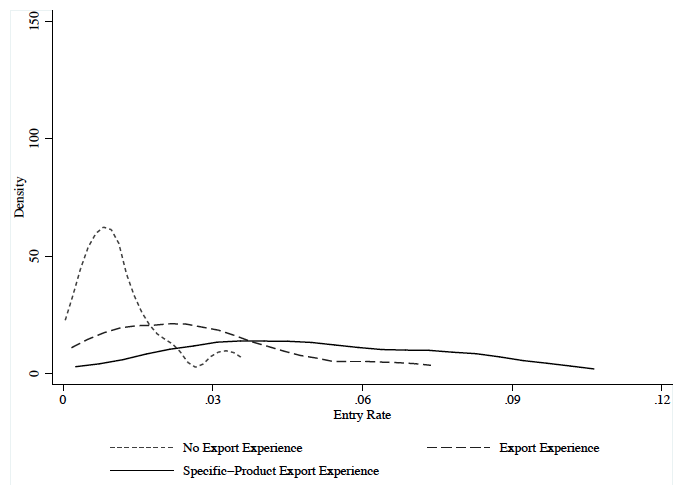 We also show that export experience is more valuable to firms selling more differentiated products (i.e. products whose attributes are more difficult to observe) and products needing more financing (for example, because of longer production processes and a larger mismatch between investments and profits, thereby requiring more managerial effort and expertise). Finally, we find that employing a manager with export experience can help firms keep exporting to foreign markets characterised by rising import competition from China. Authors’ note: The opinions expressed represent the views of the authors, and not necessarily those of the Banco de Portugal or the Eurosystem. Artopoulos, A, D Friel, and J C Hallak (2013), “Export emergence of differentiated goods from developing countries: Export pioneers and business practices in Argentina”, Journal of Development Economics, 105, 19–35. Atkin, D, A K Khandelwal, and A Osman (2016), “Exporting and firm performance: Evidence from a randomized experiment”, Quarterly Journal of Economics, forthcoming. Bloom, N, B Eifert, A Mahajan, D McKenzie, and J Roberts (2013), “Does management matter? Evidence from India”, The Quarterly Journal of Economics, 128 (1), 1–51. Bloom, N, R Sadun, and J V Reenen (2016b), “Management as a technology?”, NBER Working Paper no. 22327. Bloom, N, and J Van-Reenen (2010), “Why do management practices differ across firms and countries?”, Journal of Economic Perspectives, 24 (1), 203–224. Fallick, B, C A Fleischman, and J B Rebitzer (2006), “Job-hopping in Silicon Valley: some evidence concerning the microfoundations of a high-technology cluster”, The Review of Economics and Statistics, 88 (3), 472–481. Guidolin, M, and E La Ferrara (2007), “Diamonds are forever, wars are not: Is conflict bad for private firms?”, The American Economic Review, 97 (5), 1978–1993. Guiso, L, and A Rustichini (2011), “Understanding the size and profitability of firms: the role of a biological factor” CEPR Discussion Paper no. 8205, Centre for Economic Policy Research. Mion, G, L D Opromolla, and A Sforza (2016), "The Diffusion of Knowledge via Managers' Mobility," CEPR Discussion Paper No. 11706. Syverson, C (2011), “What determines productivity?”, Journal of Economic Literature, 49 (2), 326–65. In this respect, within the urban economics literature on spillovers, there are some contributions showing how job-hopping helps sustain the competitiveness of local industry clusters like Silicon Valley (e.g. Fallick et al. 2006). Within the international trade literature, Artopoulos et al. (2013) explain how the diffusion of business practices from export pioneers to followers can lead to sustained export growth, while Atkin et al. (2016) document a knowledge flow between intermediaries and foreign buyers leading to improvement in product quality. We present two additional results that reinforce the view that the wage premium we are identifying is associated with export-related knowledge these managers bring into firms. First, managers receive an additional wage premium — in the order of 1-2% — when their experience matches the set of foreign destinations or exported products. Second, this additional wage premium is stronger for sales and production managers, as opposed to financial managers. This is consistent with our priors that knowledge acquired in areas like sales and production is more prone to be destination- or product-specific, while experience in financing activities should instead be of a more generic nature. This is by no means a proof of causality but certainly a strong feature of the data.